This is more of an Indian than Thai curry, and has a condensed, pungent sauce. It is unusual and really wonderful. 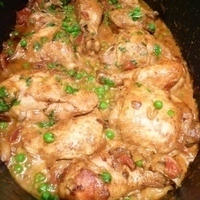 Curries are hit or miss with our kids, but they all loved this one (except for the peas...which meant more for me!) We served this with a brown/white rice mix and steamed brocco-flower. The sauce on this is so pungent that rice and a simple steamed vegetable go perfectly with it. This recipe is adapted from one in Braises & Stews by Tori Ritchie. It's the first we've tried, and I think I'm going to like this cookbook! Rinse the chicken and pat dry with paper towels. Sprinkle with salt. Coat bottom of a 5-7 quart stew pot or dutch oven with a small amount of oil and set over medium high heat. Add chicken skin side down without crowding, in batches if necessary, and cook until skin is golden brown, about 5 minutes. Turn the pieces over and cook until they are brown on the other side, about 5 minutes more. Transfer to a plate. When the chicken is all browned, add the onion to the pot and cook, stirring for 2 minutes, then add the garlic and ginger to the pot and cook, stirring, until the they are soft about 1 more minute. Add the curry powder, cumin, cayenne, and 1/2 tsp salt and cook for 30 seconds until the spices are fragrant then add the tomatoes and 1 cup of coconut milk. Stir well and let them come to a boil. Serve hot over rice and with a vegetable side. You wanna speed this up and infuse the the curry flavor into the chicken even more? Pressure cook it for 8 to 10 minutes, release the pressure, then simmer 'til thickened and finish as directed. Just sayin'! My kind of comfort food. Thanks for sharing John. It looks fabulous. Will try this soon. This looks like a nice light curry recipe. I love the dark meat, so much more flavor. Thanks for the detailed review and suggestion, Kathleen! That sounds like a simple and healthy variation. Absolutely over the top, John! I am so delighted to have tried this out and found another keeper here. I posted a photo of mine showing it served on a bed of angel hair pasta, as that's what was on hand, and for a blending of ethnic flavors, was superb. I used boneless skinless chicken thighs and breasts and cut them in large chunks. Everyone has given this a thumbs up. So glad you liked it, and thanks for adding your photo and the detailed review! I finally cooked this tonight. It was pretty good. I didn't love it, but there aren't a lot of curry dishes that I do love. I left the cayenne pepper out so that my daughter would eat it. I think if I make it again I will put that in. On the plus side my daughter tolerated the chicken and my son loved it. I'm giving the left over’s to my parents. They will probably love it. On a side note...I feel like you could add raisons to this dish...I don’t know why...I don't even like raisons that much, but it just seems like something to do...is that crazy or does it make sense? I think I made a similar recipe and it had raisons in it...Also, I didn't taste any coconut, should you be able to taste the coconut milk? This is the best recipe we've found yet for Chicken Curry. Easy too! My family really loved this recipe. My husband told me it needs to be a repeat! I also loved how fragrant it was. Mmmmm.... makes me hungry just reviewing it! Another great stewing recipe. I doubled recipe (except for the curry, cumin and cayenne because my family prefers milder curries). I prepared it the day before and reheated it for supper the next day. The left overs were deboned and froze for an instant meal to which I added chickpeas and served over rice. Thanks for another great review, TobeNourished. It really helps others decide what to try when they can read reviews like this. Thanks for taking the time! very good-I too made it with skinless, boneless chicken breast. Used all of the coconut milk. Left out the cayenne so my son would try it, but both my husband and I ended up adding some sriracha to spice it up. So glad you enjoyed it Jenn. Thanks for the detailed review!